How much is the largest home in the neighborhood worth? How do you value a house when it’s significantly larger than anything else in the neighborhood? I’m talking 30-50% bigger than even the largest homes. Four years ago I came across an enormous property in a tract neighborhood, and I ended up shooting a quick 30-second video called, “Which house is overbuilt for the neighborhood?“. Being that this home sold recently, I thought it would be interesting to do a follow-up by asking two questions. Did this beastly house command a price premium because it was so much larger than anything else? Or did it suffer loss because it was simply too big for the neighborhood? This is what the house looks like. You can check out the 30-second video below (or here) to see what surrounding homes look like. As you can see, when looking at all sales in the neighborhood over the past six years, the subject property is significantly larger than anything else. It is basically 1000 sq ft larger than even the largest homes, and it looks like a mansion in the middle of a ranch house development. Despite its large size, the subject property ended up selling at a level consistent with much smaller-sized homes in the neighborhood. The subject property was listed on MLS for 119 days at $325,000 as an arms-length sale, so we know it was adequately exposed. In cases like this it may not be possible to find other “comps” that have a similar size. We simply have to use smaller sales. The assumption of course would be to start making significant upward adjustments for square footage, but if we did that in this case the property would be overvalued (unless of course we made huge upward adjustments for square footage, but then also made huge downward adjustments for functional obsolescence (being overbuilt)). In cases like this it’s important to find similar overbuilt homes in either the subject neighborhood (older sales) or even a competitive neighborhood. This will create a better context and reinforce how the market has dealt with overbuilt homes over time. It would be golden too if the subject property sold at any point in the past so you could go back to see how the market perceived the property at the time. The Reality of a Neighborhood Price Ceiling: Every neighborhood has a price ceiling, and it’s important to be aware of where the top of the market is at. In other words, buyers tend to only be willing to pay so much in a particular neighborhood before moving on to a different community they think of as superior. In this tract neighborhood it looks like the price ceiling is around $325,000, and this mammoth home sold fairly close to that level. This is why when dealing with a huge property in a tract neighborhood, one of the first things we can do is to find out where the price ceiling is at. Is it feasible for buyers to pay above this level? That’s the big question. Ultimately in this case, despite the subject property having a much larger size, it ended up suffering economic loss because buyers didn’t expect such a large home in this neighborhood, and they weren’t willing to pay a massive premium for the extra space. This example also underscores how important it is for home owners to be aware of the expectations of buyers in a neighborhood (ask an agent or appraiser for advice on upgrades before doing an extensive remodel). My advice? Don’t overdo it. Appraisal Class I’m teaching for 2 hrs of CE: On November 11 in the evening I’ll be teaching a class called “How to tell the story of value in appraisal reports”. The class will talk in depth about how the local real estate market is moving and how appraisers can more effectively tell the story of market trends in appraisal reports. 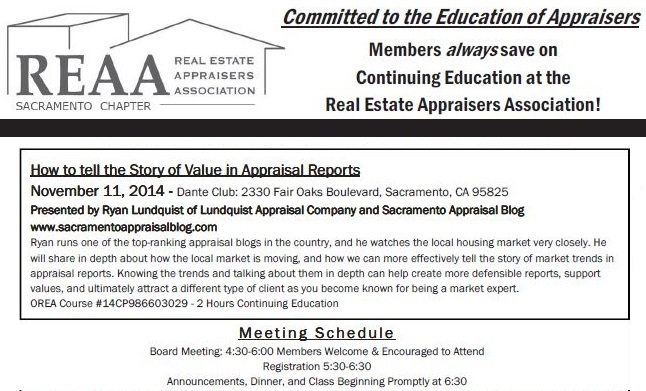 The class is for the Real Estate Appraiser’s Association of Sacramento, and it will be good for two hours of CE (for appraisers). Dinner is included, and anyone is welcome. Registration closes tomorrow-ish I believe. See the image and click here for details.